Introducing the “Cabin Fever” collection from Carta Bella Paper. This beautiful collection is printed on heavy-weight, textured paper and includes beautiful images of winter animals in a woodland setting. This prize package includes a CollectionKkit, the Frames & Tags Ephemera pack, a Buffalo Plaid Embossing Folder, Enamel Words & Phrases, and a set of coordinating Enamel Dots. Document all your favorite winter memories with this beautiful release. It’s a warm and cozy collection perfect for those cold, winter months filled with crafting. The third prize is from Brother and includes TWO FABULOSA labellers! 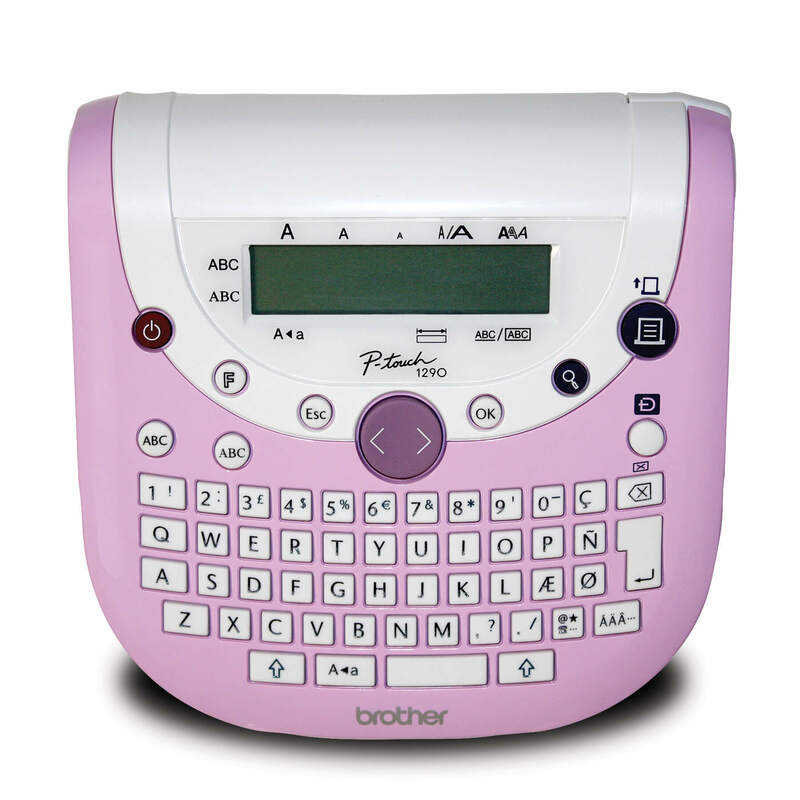 Packed full of features in a sleek handheld design, the PT-1290SBVP is perfect for creating captions quickly and neatly for all your scrapbooking projects. It features a dedicated “Deco Mode” key which gives you easy access to 15, unique pre-designed label formats for creating decorative labels and you can use the built-in memory to store up to 9 of your most frequently used labels. The PT-1290SBVP includes two 12mm tapes: White on Berry Pink and Black on Clear Acid Free tape which protects your photos. It also comes with 6 AAA batteries and a plastic storage case. The Brother P-touch CUBE is going to revolutionize the way you label! Just use your Apple® or Android smartphone/tablet along with the free P-touch Design&Print app while on a wireless connection and you ll be on your way to printing great-looking, durable labels. Take your pick from loads of predesigned home and office templates or create and save your own using 450 symbols, 60+ frames and a variety of fonts including most Google and Apple font libraries. With smartphone features like spell check and voice to text, this is intuitive labelling at its best! Includes a starter length of Brother P-touch TZe231 tape (black on white 12mm (~ 1 2 ) wide). The Fourth Prize is from Kelly Creates Have you heard about Kelly Klapstein’s new “Kelly Creates” hand lettering collection with American Crafts? 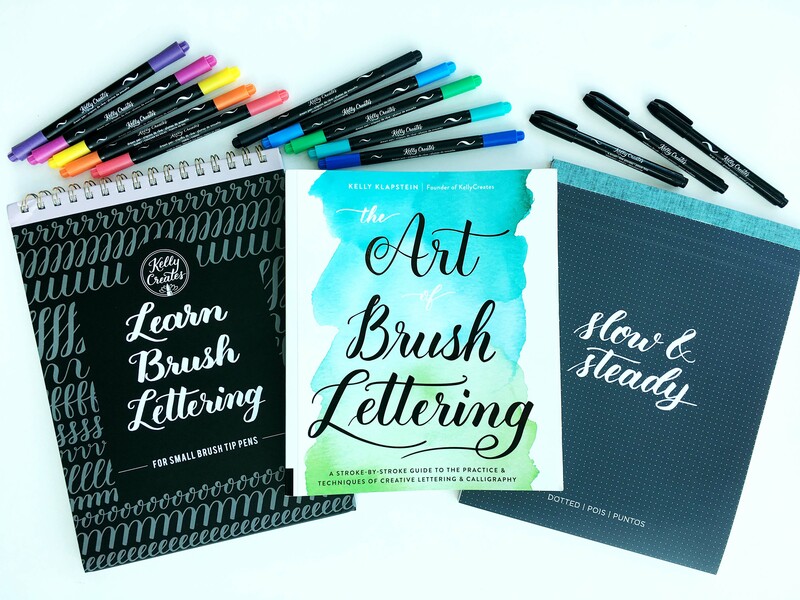 Learn the art of brush lettering with her beautiful dual tip Dream Pens, Workbook, Practice paper pad and 3-pack of black brush pens in small, medium and large tips! Breathe. Write. Relax. Sit down with Kelly’s new book “The Art of Brush Lettering” and let the calming experience of calligraphy bring joy and peace to your holiday season. 12 Days of GivingBrotherChristmascontestEcho Park Paper Co.giveawaysKelly CreatesStampin' Up! Great prizes! Definitely would love to win. Thanks for the opportunity CSM. Thank you for the chance to win and showing me some new companies I haven’t heard of before! Thanks to the fabulous sponsors – the crafty goodness each day is amazing! Those are absolutely awesome prizes. Love, love , love them all but the Echo Park prizes is my favourite colour palette. Those are absolutely awesome prizes. Love, love , love them all but the Echo Park prizes is my favourite colour palette. Live the markers too and the Brother label makers and Stampink Up has great products so that would be a nice win. Done! and 3 new ones to me today! YAY 🙂 TY for this contest. You Rock. Oh my just another day filled with more goodies! You have the absolute best sponsors, they are so generous! Wow love the prizes. Anyone of them would make me happy. Merry Christmas. Oh my gosh these prizes are so cool. Love this 12 Days of Giving so much because it gives us the chance to visit new companies and see new products. Thank you for sharing these great people and products with us! Kelly’s book is on my Christmas list. I’m looking forward to checking out her new line. Wow- I could really use all of these! Some of them are new to me. I can think of a million things I need to label! Thank you again to the generous sponsors! Off to leave them some love! Another fabulous day of prizes – you guys are amazing! Thanks so much! Great prizes today! But I guess I’m out of the runnings as I do not do Instagram, so good luck to those who do and congrats to whoever wins this package … it’s awesome! Thanks again for somehow gathering these amazing prize packages. You gals really do rock!! Wow! Each day gets better and better! Great prize package for Day 3 of the 12 Days of Giving with CSM! Wow you guys at CSM ! The sponsors are amazing! Such great gifts to be had! Thanks for the chance to win! What a fantastic prize package for today! Each day is a treat to click on to see what will be that day’s giveaway. Thank you for the opportunity to win. Love all the give aways. So sweet of you. Thank you CSM for a chance!!! Great prizes!!! OMGoodness I LOVE IT. Echo Park and Stampin’ UP are my faves. Merry Christmas to me!!! Thank you sponsors for the prizes. WoW! … just WoW! … what else can one say at the generosity of your sponsors. I’d LoVe to win any of these prises. The prize packages are amazing! Thank you so much for your generosity towards your readers. What a wonderful bunch of prizes you are giving away. Wow! And lots of winners too. Thank you. These are awesome gift prizes. it would be an honour to win any of them. You guys are so wonderful to be doing this for us…thanks for the opportunity!!!! Have a great day! Would love to be selected to win any of these awesome prizes! Thanks so much for all the sponsors for donating these wonderful prizes . Would love to win. Everyone loves Echo Park Paper. This is fun! The little P-Touch cube is adorable!! Wow, wow, wow! Awesome prizes, thank you sponsors and CSM for the chance to win these goodies! OMG!!! 4 awesome sponsors. SCM you have the best of friends. Echo Park is my favorite! I can’t believe the prizes! They are all amazing. I especially love paper and living where there is snow for 6 months of the year, this collection would work great. Echo Park paper is my favorite. Wow! So much goodness in one little post! Another fabulous day! Thanks for the chance to win! Great prizes and I would love to win them! Thanks CSM! Oh my gosh, I love the Cabin Fever collection! Thanks for the chance to win such wonderful prizes. Love the Cabin Fever paper. Thanks for the wonderful prizes. All these prizes are so amazing!!! OH my gosh, seriously!!!!!! WOW, I …want….need….love it all!! LOL The bear on the toboggan on the Carta Bella paper, totally cracks me up and I in love with anything plaid right now! Such generous and beautiful gifts to be won! Thanks everyone!!! Keeping my fingers, toes and legs crossed…..
My Christmas wish list just keeps getting longer. Thanks for this opportunity to win some great prizes. another great assorment of fabulous products. thanks!!! Thank you to CSM and the wonderful sponsors for these awesome giveaways. Another fun day of prizes today! I just organized my craft room and saw that I have been purchasing CSM since 2006, when did you print your 1st one. I often look back in the magazines for new inspiration, thank you for all the great ideas and the cool prizes. WOW! I would be so happy with any of that! Day 3 done-so much awesomeness!! These giveaways are just amazing!!! Wow even more prizes to hope for. Such fun to visit the sites. Oh how I love those gifts from some of my favorite companies. Thanks for the chance to win. Wow! So many terrific products and an opportunity to win them. I would like to try them all. This is such a neat way to celebrate giving at Christmas Time. Hope to win. Oh my gosh! Any of these prizes would be a win! Thanks for lining up such great giveaways! Would love to win these prizes. Sure could use the Brother labeller and love the Cabin Fever paper. All are great prizes. Thank you for running these prize contests. Thanks for the chance CSM! Wonderful prizes! Wow! Love giveaways & would love to receive any of these, thanks for the chance! Day 3 and what a collection of prizes. Thanks to all the sponsors for offering a great giveaway. What fun it is to do this!!! A,mazing giveaways, thank you so much! Awesome giveaways! I’ve not heard of Kelly Creates before- new products, lots of possibilities! Thanks, CSM! Wonderful giveaway! Love these products. Love all these great prizes. Thank you CSM and all these great sponsors for the chance to win such fantastic prizes. Wow! Just wow! So many great prizes from great and generous companies. Thank you! Wow–so many fabulous prizes from great companies. That Cabin fever set is great, everything is great! Thanks for the chance to win! Amazing all the goodies..You amaze me..
Wow, lots of wonderful prizes today. I’m so intrigued by the Smart Phone Cube Labeller, going to check it out! Love this stuff! Amazing prizes! Thank you! Wow, I’ve been wanting some of these so much! Love that labeled and that great woodsy paper! Ahhhh! OMG!!!!! These are Awesome prizes! Thanx for all you do CSM. How lucky to be one of your loyal subscriber I read my magazine about 12 times before the other one gets in! Good luck to everyone its a great christmas gift to receive from creative scrapbooker! Ohhh I’m so excited!This is awesome.Do many wonderful prizes.Thank you so much for a chance.I would love any one of these awesome prizes. I’m in for Day 3~ thanks!! I cannot believe these wonderful prizes!! Thank you for this chance to win!! Hiiiii CSM I would looooooooooove to win Kelly’s books and pens! I just adore her, she’s my mentor! Oh WOW!!! Such a great opportunity!! Thank you CSB!! What an amazing group of prizes. Love the fouth prize from Kelly Creates! What an incredible prize offering today. I have been drooling over that Echo Park line and the SU memory cards🤤. I love messing around with markers and experimenting with lettering and the p-touch would be very handy as I’m planning to tackle the craft room organization in earnest come the new year! Thank you to all your great sponsors and to you for the opportunity to win a very nice Christmas/birthday gift. Oooh, Merry Christmas! What great treats! Thank you Creative Scrapbooker for 12 Days of Christmas! Do you have to be Canadian to enter the contest? I’m from the U.S. and LOVE your magazine. Yowsa! The days keep getting better and better… what is not to LOVE from Echo Park and Stampin Up? The books from Kelly Create look like even I can learn to write beautifully…. and P Touch… who couldn’t use a little help to organize all their scrapping stuff? Good luck everyone! what an amazing giveaway!!!! SO excited for Kelly Creates and would LOVE to win that bundle!!! Another day of great prizes! Thanks for the chance to win! Again some very cool prizes. Love love love the paper! What great sponsors! I wish everyone a Merry Christmas. Wow what a wonderful giveaway. Thanks for the chance! Thank you for the opportunity to win such awesome prizes. Such diverse prizes… everyone would be happy to win! Thanks for the chance to win!! Love you guys!! Thanks Creative Scrapbooker Mag! Oh my gosh, what an awesome prize package!! Thanks for day 3 CSM? Thank you for the amazing giveaway, CSM! Love all the prizes and excited about the vendors. Wow! Great prizes on day 3 giveaway. New tools I did not even know existed! Thank you so much for a chance to win. Thank you for so many awesome opportunities to win such incredible prizes! Love today’s Cabin Fever from Echo Park! Happy Holidays CSM! Love the echo paper pack!!! I don’t have Instagram but I love all the products featured. More wonderful prizes. Great day of giveswsts. Thank you for the opportunity to win. Thanks for such a great opportunity to win some amazing prizes!! I am loving these prizes, so excited for December 24! Wowzers! This is amazing! Thanks to your amazing sponsors!! Oh my gosh – the Echo Park paper is amazing! Love seeing the amazing new papers and products! Oh what fun! So many cool prizes! So many nice prizes. Thank you for the fun! I love the new line. I want to be a winner! That labeler is so cute! Oh my, such great prizes. Thank you CSM and all the sponsors. I think I have Cabin Fever and must create, label or hand letter to get better!! Thanks for the chance to win and Merry Christmas! EP and CS for putting it together! Such amazing prizes again as always. Thanks to all of you at SC Magazine for your hard work. What a fantastic gift package! Would be the perfect Christmas addition. Thank you CS and your supporters! I am in love with these prizes! And it is so neat to be introduced to new things to scrapbook with. Wow! Love all the chances to win. EP is one of my favorite manufacturers, and the Cabin Fever line is really cute. And those LABELLERS!!! Waw! Would love to play with one of those! Thank you so much CSM for these opportunities! I absolutely love the Echo Park , Cabin Fever paper pack! If I don’t win it I will definitely be buying it! Thank you so much CSM for these opportunities! I absolutely love the Echo Park , Cabin Fever paper pack! If I don’t win it I will definitely be buying it! What a great opportunity! Awesome giveaway! The app and mini label maker looks sooo cool! Another great giveaway. So excited about Kelly’s new products. Thank you for the chance to win some. Thanks for the chance to win. Love all of these great prizes. My mom worked retail until 6pm Christmas Eve. So, my dad decided we would go out to dinner to a nice place on Christmas Day. One year we were all dressed up and got to the location only to discover the restaurant had gone out of business leaving several families standing there. My family ended up in a small “kitchen” Chinese restaurants eating rice, chow mein, chicken ballls etc. Needless to say, years later when A Christmas Story movie came out, we killed ourselves laughing as it all happened to us (minus the neighbor dog running away with the turkey). I love CSM and thank you for all the amazing prize donations. Merry Christmas! Oh,, my goodness! They’re all so wonderful! Any one of them would be an incredible gift! Thanks for the chance! I would totally use this for my December Daily. Love it. I’ve been creating with Stampin Up products for years and years and I love them all! Thank you CSM for another chance to win awesome products like these! Wow! This contest is making Christmas even more fun!! Another day of great prizes…love all the products! Oh my what great giveaways! fabulous prizes! Thank you for the chance to win them!!!! Love these products! Who doesn’t secretly want a labeller? Thanks for the chance to win. Love these prizes! Very nice! Day 3 and it’s getting better and better! Thanks CSM for teaching us creative way to brighten our lives. Oh my.. another fabulous giveaway!! Thanks for the chance! I love that paper it would suite my little guy we are hunters and he is in love with all things deer and moose lol!! Another Day filled with some awesome prizes!!! Wow I love everything. Such great sponsors and wonderful crafty goodness. Said hello to all the wonderful companies. Thanks CSM! I don’t do Instagram so I couldn’t follow Echo Park. I do follow them on FB. Another day of fantastic prizes. Thanks for the chance to win. another day , another day of great prizes and sponsors! Happy holidays! I would love to win any of these prizes!! These are some amazing prizes. Loving Day 3! Such GREAT prizes!! 😊 I’m in love with everything! Lots of great companies being represented here. Thank you CSM! Awesome prizes! Would love to try the Kelly Creates pens! Thanks CSM! This is fun. Happy Holidays! What wonderful prizes! So excited to play! Christmas giveaways are always the most exciting!!! So many great prizes today! All the prizes are wonderful. I would use each and every one of them. Thanks again. Love all these products! Thank you for this opportunity. Oh the Kelly creates prize looks awesome!! Thanks for the opportunity to win some creative prizes!! Thanks to all the sponsors and for having this giveaway! Love, Love, Love! Kelly Creates! Awesome prizes and enjoyed looking through your website. Yay, day 3!! Amaaazing prizes! These are amazing prizes thanks for a chance to win one of them. Super Amazing! Merry Christmas All! Love Kelly, and would love to try her new products. Thank you for the opportunity!! So many beautiful products. Great contest! What a great prize pack ,I would so emjoy everything in it! Would absolutely love this stuff! I’m so motivated to start brush lettering this year 🙂 I already started improving my calligraphy with ink but I would love to get this pack from Kelly and improve even more <3 love it!!! Many thanks to your sponsors and CSM. Your sponsors and magazine have such inspiration for us. Merry Christmas!!! Another day of fantastic prizes in this giveaway! So all of these prizes are absolutely amazing, but I’m crazy excited for the Kelly Creates prize pack!! This is so much fun CSM!! Great selection of prizes all around!! I would love to win, but then who wouldn’t lol !!! Pick me . . . . Merry Christmas everyone! Oh what fun prizes! Thanks for the chance to win some awesome goodies! I love Kelly creates and havw been following her forever! I hope I win! I love Kelly creates and have been following her forever! I hope I win! This is awesome! Wireless label Maker that pairs to smart phone??!! Game changer! I saw it here first! Thanks CSM! These prizes would all be fun to play with! Glad to have discovered some new finds on this page. So excited for this days giveaway!!! Great to be introduced to some new products. Thanks CSM!! amazing items ! would love to win ! Great giveaway. Would love any of the gifts. Thanks CSM. Wow! Such awesome prizes! 2018 is increasingly feeling like the most amazing year with learning new things! Very exciting! Such a fun prize!! The labeler is something I could really use!! CSM has great giveaways always. Love seeing all these ideas and crafts. Love the whole brush lettering style as well !! <3 I’m loving all the new brush lettering work books coming out by kelly! Can’t wait till it’s in michaels ! Thank you so much for the chance to win all these amazing products. Hoping to win one of the 12days of Christmas prizes. Thank you. Thank you for such an amazing giveaway opportunity! Merry Christmas and Happy Holidays everyone!! Jackie , thanks so much for the generous giveaways! Oh my goodness…such wonderful goodies. Such generosity warms my heart! Merry Christmas to you all!!! I LOVE Kelly Creates! It is the BEST handlettering teachings I have gotten, plus she is SO active in her FB group. Amazing prize from an amazing person! Dear Santa [aka Creative Scrapbooker Magazine] …. I want it all!!!! Merry Ho Ho! The jelly creates stuff would be amazing!!! Her new pens look so incredible! Love the products and love, love, love the magazine, thanks for the opportunity to win! Wow! So many amazing prizes! Thanks for putting this amazing contest on! Merry Christmas! Thanks for another great day of prizes. Signed up for newsletter ,would LOVE,LOVE, LOVE to win a prize! Hope everyone has a “creative” Christmas and 2018! I am so over the moon excited about Kelly’s new peoduct line! Cant wait to try them. I’ve completed all of the above for the Kelly Creates giveaway! I’ve always wanted to try hand lettering and with this giveaway I would finally get to. Thank you so much for being so generous. OOoooh la la! Would love to win. Oh my, what an incredible prize! I love it all. Wow, I’m excited about all of these awesome giveaways! Thanks to these very generous companies and Merry Christmas! Once again! Great prizes. I am particularly interested in the Kelly Creates prize. Learning to do brush lettering would be awesome! Winning something would be an amazing Christmas present for me. The package looks like a great inspiration to scrapbook during the cold winter months and beyond. thanks for the chance. Merry Christmas to all and good luck on all these great gifts. This is incredibly generous and would be so welcome at this time of giving! I am especially interested in Day #3 with its phenomenal prize packages! Thank you very much for hosting this holiday giveaway! I love love love Echo Park!!! And those label makers look so cool! Thank you for the chance to win. I can’t believe this day of giveaways! I feel like a kid in a candy store with all the amazing goodies! Thanks for the chance to win them. Day three and all is well. Love this group of prizes ! Wow each day gets even better! Echo Park is one of my favorites! Would be great to win!! Thanks for the chance!! I visited 2 of the 3 sites. I don’t have an Instagram account. Oh my goodness I am blown away by the prizes you are offering. Thank you! I noticed there is no link for the Brother prize….were we supposed to visit any page for them? I need to improve my hand lettering! Today’s prizes are wonderful; thanks to all the sponsors. Wow products -thanks for the chance to wim! Day three is a great one! Can’t wait to get in on the fun. Thank you for so many giveaways from my favorite companies! Stampin Up was one of my first introductions to stamping and now look where I am, haha! What a haul – whoever wins will have an amazing Christmas! Now I can’t wait for Xmas eve. Wonderful prizes. I literally jumped up and down when I seen this one!!! Amazing!! Kelly’s prize package would be perfect to finally dig into lettering! Thanks CSM!!! Thank you to all the sponsors and CSM! Thanks for the chance to win! What fun prizes! I haven’t heard of some of these sponsors! It’s been fun checking them out! I am playing catch up, so can’t remember if I commented on this post! It’s been fun checking out all the awesome gifts! Awesome prizes. Love Echo Park! Day 3 of 12 Days of Giving. Thanks for the opportunity CSM. Wow! What fantastic prizes. Thanks for the opportunity to win. Thanks for all the great giveaways! Happy Holidays! Wow.. what amazing giveaways… and amazing pages to find!! Great items! Would love to win one of these. Thanks for the chance to win, CSM. What an eclectic bunch of very cool prizes. Wow! Thanks for the opportunity to win. SUPER excited to win this one!! Echo Park is absolutely tops in providing us with everything we need to scrapbook and card make for events in our lives!! And Stampin’ Up is a huge teaching asset too. I’m super in love with Kelly, I have started following her Facebook and I even subscribed to her blog because I’ve been wanting to find a mentor to teach me fancy lettering and I think she will be da Bomb!! Thanks for another great day CSM!! This is amazing products. I am really in need of a label maker and I love the Christmas collections from Echo park,. Thanks for making this possible. It would be a gift to remember. Day 3!!! What great gifts! I love Echo Park and haven’t seen this Cabin Fever products, I love Stampin Up and use them often but don’t have these goodies, I have a small Brother P-Touch and it’s great, and I’ve never seen Kelly Creates. More wonderful stuff! I would live to try Kelly’s pens! Would love to have any of these prizes. Another fantastic days of giveaways. Thank you and Happy Holidays. Wow, great prizes. Thanks for the chance to win. These giveaways are amazing! Some of my very favorites! Thank you again for sharing! Another day of crafty goodness. Thank you and happy holidays! Would love to win me some card making supplies! You have the best sponsors! Thanks for this 12 Days of fun! Great prizes! Thanks for the great giveaways. Hello hello hello and wow wow wow what prizes!! Love love love them all!! Thanks CSM!!! Such great ideas all year. Round! I love Kelly Creates! Hoping to pick up all her stuff soon!! Wonderful prize packages!! You have some great sponsors!! Thanks for a chance to win!! Whooooo I can’t believe we could win Kelly create’s new brush pens. So awesome! These products make me want to participate in various seasonal activities with my family so I can scrapbook everything later. What great gifts you have. Thank you. Absolitely love this nrw line from echo park snd Kellys books would be amazi g!! Love the paper, Stampin Up kit, Brother label maker and love those Kelly’s letter collection. Awesome! Every day keeps getting better and better! Love the prizes. Thank you for the opportunity to win something like this. WOW! Another amazing day of sponsors! Thanks for the chance to win! I love those prizes. Great selection. Thanks for the chance. I would love to find these crafty goodies in my stocking! Thanks for these beautiful products. A fantastic day of give always!!! Love all these companies! Love the 12 days of Christmas giveaway – thank you for your generosity. Wow! Lots of give aways. There will be lots of jolly csm readers this Christmas. Another great day of prizes! A big fan especially of Echo Park! What fabulous prizes again today – I would LOVE to win one of those label makers, among others!! Thank you so much to all the sponsors! What a fun Giveaway!! I love Echo Park, and a label maker would be the best win ever!! Another amazing prize to be won! Great prizes for whoever wins one of these. Good luck to all. Thanks to the sponsors. Yay to CS? Will I be lucky to be elfed any of these great prizes? #sogenerous That is the title for today’s prizes! Thank you CSM and sponsors! Hope I’m on Santa’s good list this year Ha Ha!! Thanks for the chance to win some wonderful prizes CSM!! Such amazing and super generous prizes! Whoever wins is sure to be very happy. Good luck to all! More great prizes. Also so many new products. Very exciting. Wow! Again with the amazing prizes!! Wow! What amazingly wonderful prizes today! Thanks for the chance to enter! These prizes are so drool-worthy! Sooooo yummy! keeping my fingers crossed for all this amazing prize pack. Every day has such great surprises. Hope I have a chance to win!! Gosh your really have found the best prizes for your amazing giveaway .I would love to win this lovely lot! Thank you. These are great prizes. OMG the Cabin Fever collection is so cute !! I could use it on almost all our vacation pics. Merry Christmas fellow crafters !! And thank you to all the participating companies for sharing such great prizes. I absolutely love the prizes for today, thank you so much! More great prizes today! Thanks CSM! Great prize pack today, love them all and would use any one of them! A label maker you can use from your phone?? Awesome! Wow! Love Cabin Fever” collection from Carta Bella Paper. This is such a beautiful collection! Thanks for the chance to win! Love it all! Great prizes ! Thank you! More exciting prizes. I would love to win any of them. Love to win all these great prizes! I love today’s products. Echo Park has some lovely paper. So in awe of these prizes and companies. I would love to win ANY of the prizes, as I’m an avid BuJo-er and everything would be lots of fun to try out! Broke down and opened up an Instagram account … so am now following Echo Park. I had visited Stampin’ Up and Kelly Creates on Day 3, so now finished this by going on Instagram! Thank you for the amazing opportunity! Love me some Echo Park! Thank you for a chance to win a prize. Wonderful prizes, thank you for the opportunity to win! Your prize give away is awesome, sign me up. What a wonderful opportunity for a special Xmas gift!!! Thanks for offering Kelly’s new stuff. I can’t wait to get my hands on it! Great gifts again. Thanks for doing this every year. Kelly Klapstein is an amazing artist – Thank you for sharing with us! Wonderful prizes from the sponsors. Thank you CSM and sponsors for the fun. I’m having fun checking out what each day has to offer one lucky winner. Thanks for giving! IN more ways than you can imagine! I’m just so thrilled about the opportunity to enter your giveaway. You have some amazing sponsors with lots of amazing prizes. Thank you for your generosity and that of your sponsors! That Brother label er is so perfect for small pages! Good morning. LOVE. All the offerings. Thanks! So many great prizes to win from several great sponsors! Good Luck everyone!!! Awesome prizes. Thanks for the contest. Would love to win! Thanks for introducing me to a new product- Kelly Creates. Thanks for another day of great prizes. Wow! This would be SO awesome to win, espacially after such a bad year for me! Thanks so much!! These are beautiful prizes that I could put to good use for myself and in workshops. Your sponsors are very generous! You have such nice giveaways. Thanks for doing this. Take care guys. Neat stuff! Thanks for doing this amazing giveaway! Creative Scrapbooker is a great magazine full of techniques, articles and ideas. Thanks for this opportunity to win these great prizes! Wow, some awesome tech here I’ve not seen before! So many awesome prizes. Thank you. Merry Christmas. I love Carta Bella products! Cabin Fever is my favourite collection this year…..would love to win a little more of it!! And the label makers…..need them to get my scrap room organized!! I haven’t used markers yet. It would be great to win some! Thanks for the opportunity. Thanks CSM for giving us the 12 days of Christmas. This is so exciting. I love the contest and the sponsors. Thank you for putting it together! Hi Jackie it’s Jacqui.. Day three is an amazing selection of items. As always thanks for the opportunity to win these incredible items. Either way win or loose thanks for the Festive fun. I fell in love with a comment left by Darlene Smith about her connection to the Christmas Story movie. So here’s my story…when I was young I had to wear curlers to bed to get a nice curl the nex day (thank heavens for the eventual invention of the curling iron). So one Christmas Eve was spent with no sleep in order that I could dazzle the world with my curls. Flash to Christmas morning when my brother thought I had slept too late so threw a bucket of water over me too wake up. Best laid plans are often destroyed by big brothers. Wow! What a terrific prize pack. Thank you for the chance to win! Love all three companies featured today. Thanks CSM! These are all amazing prizes! That Kelly Creates set would be awesome! Wow what an amazing batch of prizes. Thanks for the chance to win. Love the prizes today. Thank you for the chance to win. Thanks. Dont think im doing this right but worth a shot..
Would love to have the paper collection from Echo Park. All these prizes would be a great addition to my craft room. Thank you. Amazing products and such generous prizes! Great magazine. Thanks for a chance to win. Thanks to CSM and all the amazing sponsors for the chance to win wonderful prizes during the 12 Days of Giving! Thanks for your generosity! Love the products featured in this giveaway. Would love to win. Happy Holidays! Thank you so much for sharing these fantastic prizes. Thank you CSM, Echo Park, Stampin Up, and Kelly Creates for the great prizes. Simply amazing prizes. Thank you CSM! Amazing! Thank you sponsors and CSM! ABsolutely love these awesome gifts and your magazine! Would love to win one of these great prizes. Thanks for the chance. Oh by golly, loving all the stuff you are showing us. I’m gonna have to make a list. WOW!! Super fun prizes today! Would be fantastic to win! Thanks to all the sponsors! Oooh, fabulous prizes today, I would love to take a lettering class! Thanks for the chance to win! These are by far my favourites please pick me so I can share with my mom for her birthday! OMG…love love todays giveaways!! We are so lucky for the sponsors and chances to win!!! I always wanted to try that labeler!!! Oh my goodness… a PTouch… exciting. Thank you! The prizes just keep getting better and better. Thank you! Wonderful array of gifts today! Who knew that label makers had gotten so fancy and technically advanced – LOL! The right accessories from Echo Park and SU are always a must have. It has always been a dream of mine to be able to do beautiful Calligraphy like Kelly. I was hoping for some of her books this year but had no idea of the range of products she offers! Thank you for a chance at all of them, but mainly for introducing me again to all the FB pages. So many great prizes! Merry Christmas!